I also teach 2nd Grade Sunday School in a Synagogue this school year. Many of my educational crafts I come up with on my own to cater to my lesson plans. 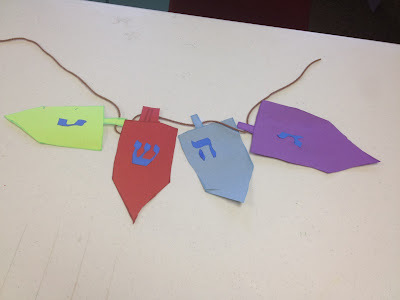 This craft is not only for decorative purposes but to educate kids on how to play Dreidel! I call it... Dreidel Garland! *Optional: I had the hebrew letters pre-drawn on construction paper for my students to cut out. This eliminated any "I can't do it" comments from my students. 1. Start by having students identify each letter and what the letter stands for. Nun: Nothing is taken from the pot. Gimmel: You can take the whole pot. Hay: You can take “half” or the pot. Shin: You must put one back in the pot. 2. Draw a dreidel shape on the board for the class to see. My students are really empowered to draw things on their own. I had them draw a square, a triangle on the bottom and a small hat (or rectangle) on the top. 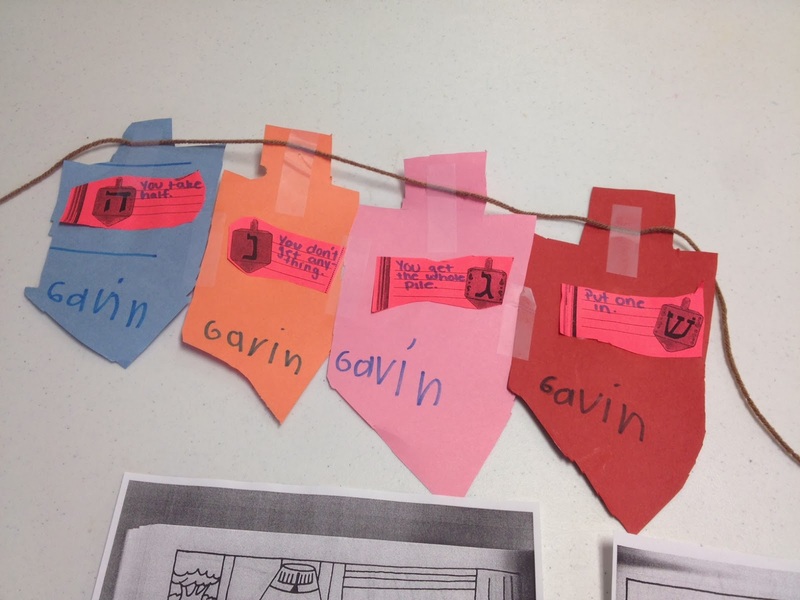 Tell the students to cut out their first dreidel and trace it for the next three dreidels so that they are all roughly the same size. 3. Have students cut out their letters. Nun, Gimmel, Hay and Shin. If they need help, have your scissors ready. 4. Have students write down the rules for each letter on a slip of paper. This slips of paper will be attached to the back. 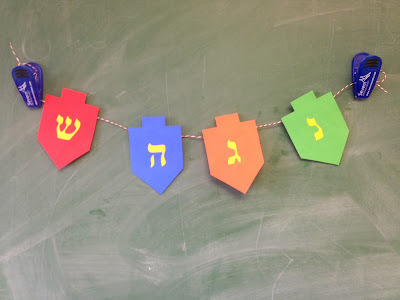 Have the students match one letter with it's slip of paper to each dreidel. 5. 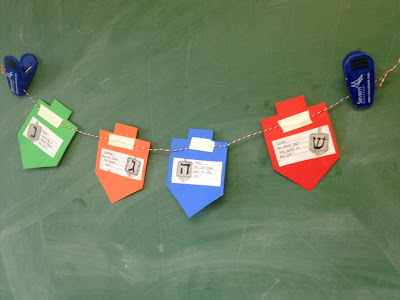 Once students have finished their dreidels, cutting out their letters and rule slips. Pass out the glue. Make sure students are gluing things where they need to be. 6. Attach Dreidels with tape to a piece of yarn. Remember we read Hebrew right to left. The letters should read in the following Order: Nun, Gimmel, Hay and Shin. They're now ready to play Dreidel!